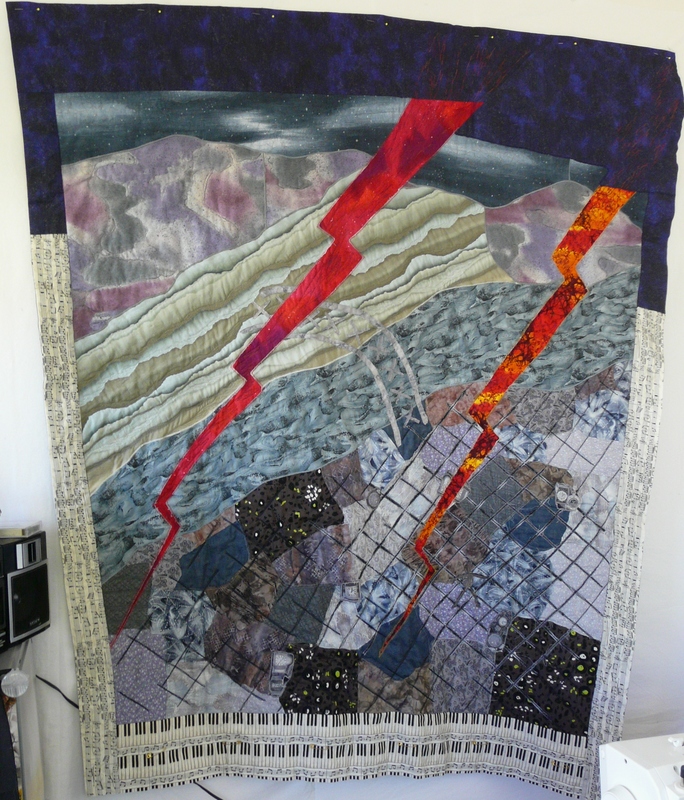 Textile Art, Quilts, Fiber, Multi-media Art. You dream it, I'll create it…with joy! Wonderful news this week! I have been invited to be a featured artist at Illahe Gallery www.illahegallery.com this February. 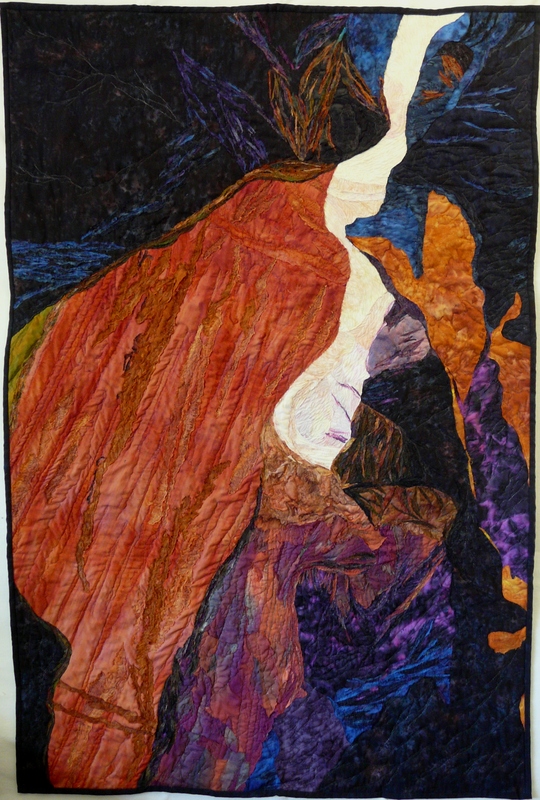 I will be creating 2 – 3 pieces similar in process to “Antelope Canyon,” below. I begin with a photo or photos of a place in nature; I create an initial design of about 18″ x 24″ and a final design of about 3′ x 5′ with much greater detail. I love this process. I feel myself on the inside of the inside as I commune with the heart of nature that the image yearns to bring forth. I experience a deep communion with the place and qualities of the earth I am rendering. It nourishes my soul, and I emerge from hours in my studio with a happy heart and a light spirit. I am in the process of choosing my images for the show. I will perhaps choose a further image from the Slot Canyons…very different from “Antelope.” I have also long desired to create a tide pool image. And I have wonderful images of snow creatures, trees and snow, that I would love to create in fiber. “Antelope Canyon” 3′ x 5′ Slot Canyons of the America SW, where floods have worn deep, narrow canyons. Sunlight overhead casts deep shadows onto the sandstone walls, creating dramatic colors and contrast. Commissions accepted. Please contact me at sknead7@aol.com or call 541-292-9390. "Today the Tao is Dancing"
Just as so many ancient spiritual traditions are being renewed today as the world’s heart begins to open again, so this piece reflects an ancient tradition dancing in the light of new energy. The Tao’s way is very ancient, serene, and patient. The new world moves more quickly, yet when that movement emerges from a still, silent, deep place it is beautiful dance…in whatever form. I accept Pay Pal and personal checks. As always, I am available for commissioned work. Please contact me at sknp4710@aol.com or call 541-292-9390. My most recent piece, “Lightening Storm” sold quickly. What a gift! So, while in the midst of a move, my creative juices are given good reason to take a time out from boxing books and crating cartons to work on a new piece. All my pieces create themselves in the sense that I start with an idea that beckons me, like chasing the end of a rainbow. Once I begin, the piece “talks” to me, takes its own turns, sometimes sets off in directions (quite stubbornly I might add) that I had not intended, nor am I prepared for. It is not altogether uncommon for me to have an idea, start to work, only to set it down…because, while I can feel that the piece knows where it wants to go, I am not able to “download” how to get there. “Today the Tao is Dancing” is one such piece. I am excited to be working on it again. I pulled it out in the midst of moving, held it up for the umpteenth time…and suddenly knew how to take it where it wants to go. I love that feeling!!! So I now return to my studio, perchance to finish it today. This time I will get a high quality photo to share with you very soon. Then hang it at the gallery: Ashland Art Works Gallery, Ashland, OR, 291 Oak Street. May we all feel the love of creative life flowing through us, relaxing our worries and filling us with soul nourishment…whatever form your creativity takes, may you relish it! And a nature photo to share until my next piece is here. 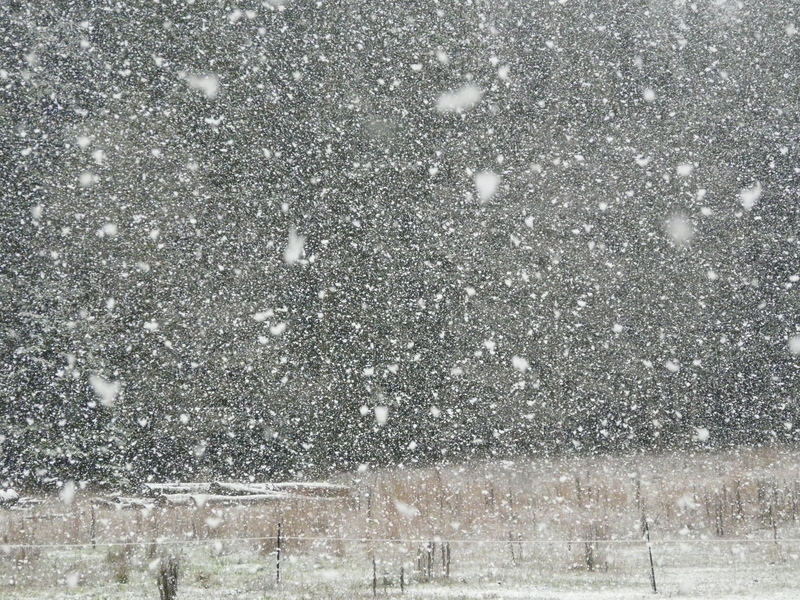 "Snowstorm" Big fat, fluffy, dry flakes. A cool counterpoint to our Dog Days of August! I finished “Lightening Storm” but forgot to photograph it before hanging it in the gallery. For those who are local, it is in “Rustic Gallery” at Ashland Art Works, 291 Oak Street, Ashland. Take a lunch and go sit by the creek after seeing the art offerings, mine included. If you haven’t yet discovered the sitting area by the creek, it is one of the sweetest spots in Ashland. I promise to get a photo of “Lightening Storm” and post it this week! In the meantime, I thought you might like to see a piece I started years ago. I still have a few bits and pieces to add as finishing touches. It is a healing piece relating to a dark and difficult period in my life, the years between 14 and 17, when I was utterly a fish out of water…almost literally–but that’s another story. 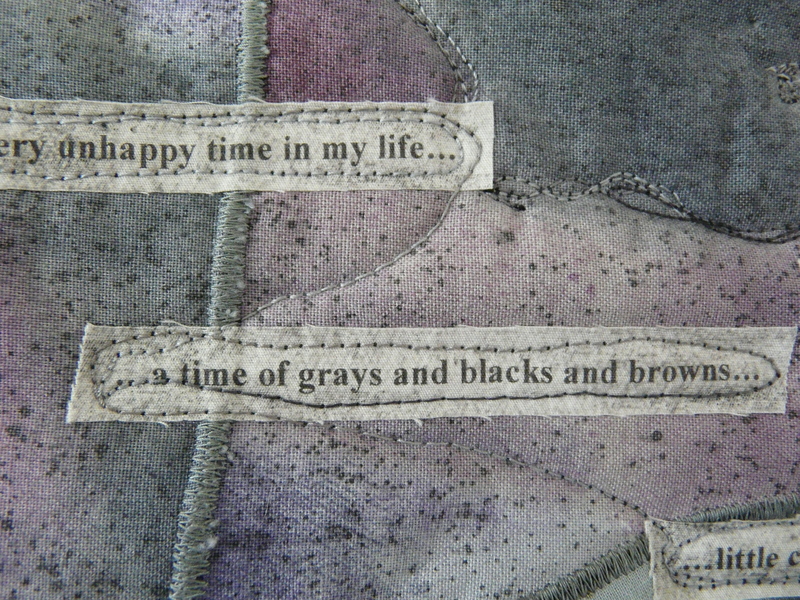 This piece began with a poem and emerged visually over time. For me, it perfectly expresses my felt state during these years. Here is the poem, which also makes it’s way across the face of the piece. Music was the new life I hoped for…the only place where color still lived…along with hope…and the possibility of love. 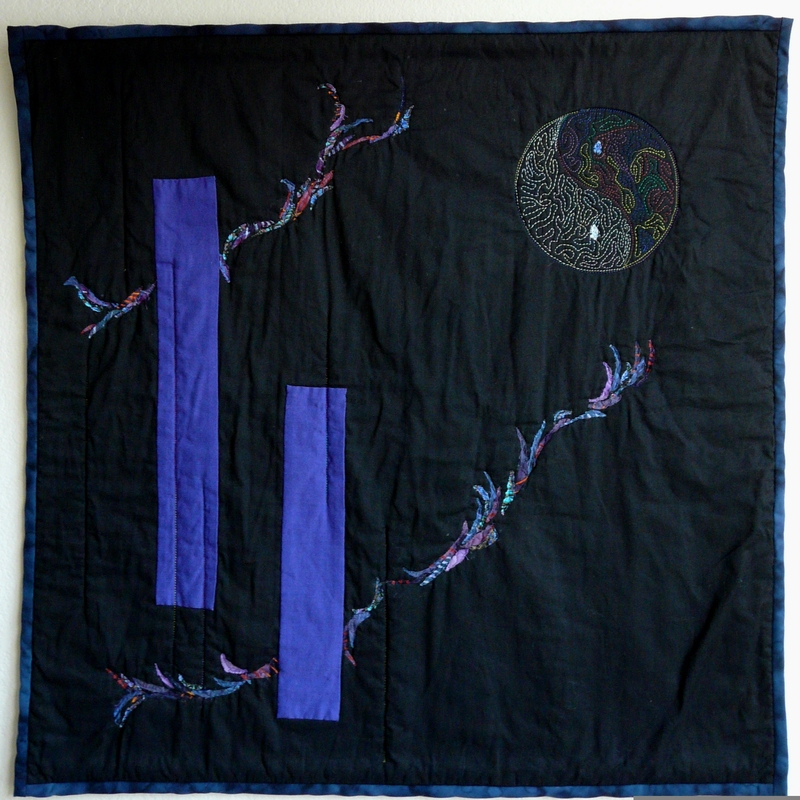 Poem for "Louisville: A Healing Quilt""Lonely feet walking..."
“Abraham’s Children” Original Textile Art Prints, the perfect gift for this season of Peace.